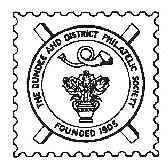 Dundee & District Philatelic Society held its Annual Dinner on Thursday 15th May at which a number of the members and their spouses attended. The dinner was held at the Invercarse Hotel in Dundee, and the evening soon warmed up with good food, drink and great company, and a good night was had by all. With current President Alan Roy stepping down members elected Vice President Francis Podger FRPSL to take over as President. David Millar has been elected to be the new Vice President. Alan Roy has also decided to step down from his post as ASPS Rep and members elected Norman Kelso as the new ASPS Representative. The three committee members for next year will be Doug Howkins, David Dobson and Harry Jackson. Following the AGM members tucked into drinks and cakes to celebrate the end of another highly successful philatelic year. Below are pictures of members enjoying the fare. Dundee & District Philatelic Society are proud to announce that local member Francis Podger who was recently awarded fellowship of the Royal Society of London has scooped another award. Francis has been awarded The Tapling Medal for the best paper in 'The London Philatelist' by the Royal Philatelic Society of London. Singapore: The Use and Development of Revenue Impressed Stamps The Victorian Era to 2012. At the final display of the year Dundee & District Philatelic Society were pleased to welcome Jean Osborne from Falirk & District Philatelic Society to provide a display of Papua, New Guinea and Papua New Guinea. Jean was recently appointed as president of the Association of Scottish Philatelic Societies at the 85th Congress two weeks ago. Jean began her display with a background to the country from when it was discovered in the 1500's by the Portuguese through its relationships with Spain, Great Gritain and Germany up until it gained independence in 1975. The display included stamps and covers beginning with German stamps overprinted with New Guinea, followed by stamps overprinted GRI once Australia took over. A range of definitives and commemorative stamps, including stamps with 'A fishing boat' and Birds of paradise, flora and fauna were on display. Dundee & District Philatelic Society are proud to announce that a number of its local members won awards at the latest Association of Scottish Philatelic Societies Annual Congress. Sandy Forbes won Gold (and the Ferris Trophy) in the General Class - Pre-1900 competition for his display of 'The South Australian 2d Surface Printed Issues of 1868 - 1908'. For this display Sandy also won the Dr Hirst Bowl for Best presentation. William Harry Jackson won Silver, also in the General Class - Pre-1900 competition for his display of 'Postage Stamps of Hyderabad 1869 - 1949'. President Alan Roy also won Silver in the Scottish Postal History competition for his display of 'The Uniform 4d Post'. Congratulations to all three members. Last night's meeting of the society saw members entertained by two members of Aberdeen Philatelic Society. Husband and wife team of Fred and Chris Jefferies provided two fascinatingly different displays. Fred started the ball rolling with a display of outgoing mail from Germany between the period of 1928 to 1966, which included Graf Zeppelin covers. Also included in the display were German stamps which highlighted the difference in the numbers of stamps issued in the 1950's compared with today. There was a shett of stamps for each of the years between 1949 and 1955 (maybe 2 sheets for one or two of the years), whereas there were 9 sheets of stamps specifically for 2013. In the second half of the display Chris put on a show of postcards, stamps, covers and verious ephemera to do with the Cirkus. The display started with the concept of a cirkus being conceived by Carl Hagenbeck and took us through cirkus performers such as Charlie Cairoli, Joseph Grimaldi onto various cirkus promoters such as Billy Smart and modern day equivalents such as Cirque Du Soleil. It weas intriguing to see the variety of countries such as France, Monaco, Finland, Australia which have issued stamps displaying cirkus performers as well as the expected countries such as Russia, China etc. To finish the display Chris also had on display a number of posters which would be displayed in towns adcvertising the cirkus companies. Thursdays meeting of the society saw Paul Stevens from Perth Philatelic Society visit to provide members with his display of 'The Levant'. Paul started of his display by giving an introduction to his display thus setting the historical scene from 1869 to the 1920's. His well written - up display of stamps (many as blocks), postal stationery and covers traced the changes of Post Offices and of currency and inflation. The large number of post offices was due to them having been situated within the various embassies. Paul's display showed material associated with many of these post offices. His display covered the period of the First World War during which time many of the post offices closed. Some of the more unusual items were from the Romanian PO that was on a ship in the Red Sea and was closed by Turkish authorities after 8 months; also stamps of a number of countries that were overprinted and used by White Russian forces as they fled from Russia. At last nights' meeting of the society members were entertained by displays from two members of Arbroath Philatelic Society. First to display was Brian Cargill who provided a display of Lighthouses from around the world. The display started off with 'appropriately' The Bell Rock Lighthouse and showed covers and handstamps relating to the lighthouse. Brian then proceeded to talk about the other sea washed lighthouse 'the Eddystone' lighthouse and this was followed by an assortment of covers and stamps, well written up, from various countries such as America, Denmark, Isle of Man, and also included in the display the Statue of Liberty which was actually operated by the Lighthouse Board of America. The second part of the evening was a display from Chad Neighbour. Chad started off with an emotional display of memorabilia, including personal letters, concerning his fathers involvement with the D-Day landings on Omaha beach. The display showed pictures from the 60th Anniversary of D-Day and FDC's signed by Generals and other officials. The second part of Chad's display covered postal history and was a display of postally used compound stationery, i.e. double embossed covers. The covers covered the A-Z of countries and even included a triple embossed cover. One of the purposes of the society is to promote the education of philately and with that in mind this year a date was set aside to allow newer members to the society to carry out displays of 40 sheets for the first time. Other members of the society would then be able to provide any pointers to aspects of the displays which could be improved upon with a view to the exhibit being displayed at competition levels be they National or Federation level. To start the night off both the President and Vice President provided a few hints as to what judges may be looking for when assessing a display by showing a few sheets from their own gold medal displays. First up was David Millar whose display was 'The Story of the Penny Stamp' which started with the penny black and progressed through the penny red withdifferent inks and through the different reigning monarchs right up to the Wilding and Machin stamps. The second half of the evening started off with Norman Kelso displaying 'Canada Definitives' for the reign of Queen Elizabeth II. The display started off with the Karsh Portrait definitives, progressing through the Wilding, Cameo and Centeenial definitives into the Caricature Group, Environment, Artifact and Wildlife series. This was then followed by Harry Jackson who provided a display of Hyderabad stamp issues up to its annexation into India in 1948 as well as postal covers showing the operation of the British India Postal system in Hyderabad, the Postal Sytem used within the state and the Interaction of both. Last nights' meeting of the society was an opportunity for all members to provide their own themed displays based on the letter 'K'. A stupendous thirteen displays were given by the attendees, which were extremely varied and educational, even to the point of stretching the use of the letter 'K' somewhat. The night was started off with stamps and postcards from Kasai which were overprinted with 'Congo', and immediately followed with King Edward VII keyplates from Singapore and pre-printed stationary to Hong Kong. We also had displays of Kuwait stamps, postcards with Swiss Hotel caches and letters sent to Kunming in China from various countries. We then had a geographic round trip of Scotland with 20th Century handstamps using the letter 'K', followed by stamps and Miniature Sheets of Kings and Hong Kong, with the first part of the evening finishing with postmark cancellations from Keiss as well as Krag maching cancellations from Wick and Thurso. The second part of the evening was just as educational, we started off with stamps and cards concerning the language of Indians in Peru i.e. 'Kechwa' and then had stamps, including the Web Ellis Cup in 3D from New Zealand using 'Kiwis' as the 'K' theme, followed by a variety of window booklets from the UK on a theme 'Key Knowledge and Know How in understanding Window Booklets'. Then came stamps from Norway (Kingdom of) and information on Madiera which stretched the use of the letter 'K' somewhat. Stamps related to the activities of Kicking came next which covered Football, Rugby and Dancing. The final display was of stamps related to Kings and Queens and postcards depicting ships beginning with the letter 'K'. The first meeting of 2014 was the Annual Competition on 9th January at members competed for in four competitions for the Thematic Shield, the Postal History Shield, the National & General Shield and for the prize of winning Social History which unfortunately does not have a Shield to be presented for it. In the Thematic Shield the entries were 'A Celebration of Science' displaying scientists commemorated in Stamps/Covers and 'The Beira-Umtali Railway' concerning Railway mail between Mozambique, malawi and South Africa. The Winner of the Thematic Shield was Charles Lloyd with 'The Beira-Umtali Railway'. In the Postal History Shield the entries were 'The Uniform 4d Post - A successful transition to Postal Reform' and the Carriage of Mail to British Central Africa through Portuguese East Africa. The winner of the shield was Alan Roy with 'The Uniform 4d Post - A successful transition to Postal Reform'. In the National & General Shield the entries were 'Canada Definitives - The Environmental Issues' and 'The Colonial Belgian Participation in the East Africa Campaign of WWI via Postal Stationery'. The winner of the Shield was Norman Kelso with 'Canada Definitives - the Environmental issues'. The winner of the Social History section was Doug Howkins with his entry of 'The Spanish Civil War'. This latest meeting on 12th December was the One-Sheet competition for members and a chance to show off their latest acquisitions. 15 members submitted a superb variety of entries for the competition. In third place was David Easson with his entry about the Broughty Ferry Connection. Runner-up was George Lewthwaite with his entry of Telephone Company stamps. The winner of the bowl was David Millar with his entry of the millenium 1st class stamp showing 9 of the potential 37 varieties available. In the second part of the meeting 13 members displayed their latest acquisitions for the other members to peruse. Some of the displays covered stamps and covers from Madiera, Suriman, Curacao, Sierra Leone, Jersey, St Pierre et miquelon, Portuguese East Africa, Uganda, as well as covers relating to oil, and a passport from Singapore in 1916. Thursday nights' display by Ian Gray of Falkirk Philatelic Society featured stamps, cards and ephemera showing the work of the Japanese artist Hiroshige. Stamps from a number of different postal authorities were on display featuring the work of this artist. Ian provided details of the different printings produced and the types of paper used. Part of the display detailed the 55 stations situated along the 'Tokaido' route which runs between Edo and Kyoto which were used as resting points or for overnight stays for weary travellers. The display also featured a variety of birds and flowers. A wide colourful range of paintings by Hiroshige which were well produced on stamps was on display. At last nights' meeting of the society four members from Stirling Philatelic Society put on a wonderful variety of displays for members. Starting off the night was Bill Izett who provided a light hearted display of 'Let there be Music' which icluded stamps, covers and postcards covering Religious Music, Church Bell ringing, music by choirs. This led on to Composers, conductors and music from Sea Shanties. Following on after Bill came Pauline Cheasney with a display of stamps and covers from Aden where she lived and worked for a number of years, thus Pauline was also able to recount memories of her time their during the brief talk. The second half of the display commenced with Bob Clark providing a display of covers from the period around June 1940 when a lot of mail was disrupted due to the war. The second half of the display commenced with Bob Clark providing a display of covers from the period around June 1940 when a lot of mail was disrupted due to the war. Bob showed a variety of covers from various countries and was able to recount the circuitous routes they had to take, either by air or sea, to get to their destination. For one or two of the covers he showed that they were probably carried even by 'enemy' aircraft, showing that the mail still gets through regardless. Last up was Richard Beith who display covered Covers relating to Polish forces in WWII and Covers stamps and postcards relating to the Polish Composer Bedrich Smetana. At the latest meeting of the society Stuart Gardiner from the Caledonian Philatelic Society put on a display of 'Early Europe' for members. In the first half of the display Stuart displayed a range of very early stamps and covers from Greece and Turkey during the 1860's - 1870's. Stuart pointed out that the early issues of Greece were actually printed in France with later issues printed in Greece but were found to be of inferior quality. The display covered a range of types of printing and paper used. In the second half of the display Stuart displayed stamps and covers from the Italian States such as Sardinia, Tuscany and Lombardy/Venezia finishing with stamps and covers from Germany and France. Stuart also identified that during this period a lot of forgeries were known to exist and he displayed one or two of these. At Thursday nights' meeting of the members of the society welcomed Ian Anderson from ther Scottish Philatelic Society who gave a display of the Gold Coast and Ghana. In the first half of the display Ian provided members with a brief history of the formation of the Gold Coast from being a protectorate through to becoming a British colony in 1874. The display consisted of the development of the key plate issues from Queen Victoria up to 1928, including bisected stamps, overprinting, and details regarding the use of various inks, watermarks etc to prevent forging. In the second half of the display Ian displayed stamps from Ghana following its indepence in 1957. The (what has to be said unique) display consisted of stamps designed by M. Goaman including the actual hand printed essays and designs he submitted to the Ghanaian government most of which were unsuccessful, but including some which were accepted along with the resulting published stamp. At last nights first meeting of the season Society President Alan Roy started off the new season with an excellent display of stamps and covers from Northern Rhodesia / Zambia. Alan	started off the first part of the evening by describing how the country of Rhodesia was formed following its discovery by Cecil Rhodes, right up to its independence and change of name to Zambia. Included in this display were a number of stamps from Northern Rhodesia, Southern Rhodesia through the period of Rhodesia/Nyasaland until it finally decame Zambia. In the second half of the display Alan provided a display of a range of covers from Rhodesia - Zambia, of which a significant number of covers were addressed to Alan and his wife Rona who lived in the country for a period of time. Alan also included in the display a number of covers which showed the development of Airmails within the country.